This excursion offers a great way to travel to the top of New Zealand to experience its beauty, history and scenery. Not only does it avoid you needing to take a relatively long road trip, but you get to experience Cape Reinga from the air and on land. The tour begins with a 45 minute flight up to Cape Reinga via Northlands’ spectacular harbours, such as the Whangaroa Harbour and the Rangaunu Harb..
During your trip to New Zealand, be sure to venture to the very top of the North Island to Cape Reinga. The rolling hills of Northland's rural countryside, breath-taking coastal views and native forestland pave the way north before you finally reach the untouched and wildly beautiful region of Cape Reinga. Your coach drive will take you along the sands of the Ninety Mile Beach – look out the windo.. The Bay of Islands Cultural Waka tour is an interactive Waka canoe experience that provides a rare and unique insight into the Maori ancient customs, rituals and traditions. During this Maori Waka tour you will meet with local Ngapuhi whose traditional knowledge and storytelling skills are legendary in the Bay of Islands. 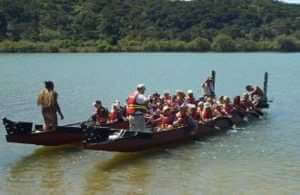 Their ancient histories and stories are shared with you as they paddle toget..